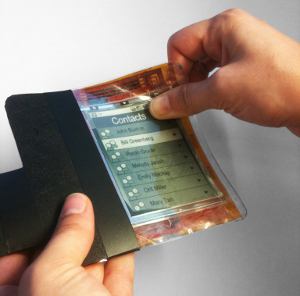 Researchers from Queen's University in Ontario Canada this week unveiled a prototype of their "paperphone," a smartphone that has a flexible e-paper display instead of an LCD/TFT touchscreen. The prototype consists of a 3.7" electrophoretic E Ink display rigged up with 2" bi-directional bend sensors so that the user interface can respond when the screen is bent. The machine was built with E Ink's Broadsheet AM300 prototyping kit, Gumstix processor and Arduino microcontroller. All of the sensor recognition takes place in a connected laptop running Cycling 74's Max 5 programming environment. "This design maximizes the flexibility and mobility of the display, while keeping its weight to a minimum," a whitepaper from Queen's University's Human Media Lab said. Dr. Roel Vertegaal, lead researcher on the project, says the technology will make current smartphones obsolete in five to ten years. Though some have heralded the paperphone as "first of its kind," it is actually more of an evolution of the E Ink screen that has gone on for nearly a decade. In fact, there have been several attempts to create flexible E Ink smartphone displays in the past, most notably from Polymer Vision, a company whose entire purpose is in creating rollable displays. In 2008, Polymer Vision unveiled the Readius 3G mobile phone which had a 5" foldable E Ink display. That device, however, did not accept screen folds as a type of input, and rather relied on other mechanisms for input. The Paperphone will be given a public unveiling next week at the Computer Human Interface conference in Vancouver.